It is 5 am and it has rained heavily last night in Darjeeling. Stray drops of water which got trapped in the leaves of trees are finally falling in puddles on the road below making a distinct sound as the whole town sleeps. I quietly close the doors of my hotel and tip-toe into the light rain and off motorbiking to Bhutan. “Yesterday, six men fell off the mountain and died while driving from Phuentsholing to Paro.” “Be careful of the black ice on the roads to Bhutan. You will never know when the bike will slip.” I have got such suggestions from everyone whom I have met in the last three days I have spent in Darjeeling. I have taken the necessary precautions of long distance motorbiking, but I am still nervous from all the advice that I have got. As I discovered Bhutan by each passing day, driving here is not that bad after all. The villages en-route are just beginning to wake up as I roar past them towards Bhutan. The engine of my Enfield is giving out its gentle thump that is echoing across the tea gardens of southern Bengal. People call me crazy but the unparalleled freedom of travelling solo is addictive. 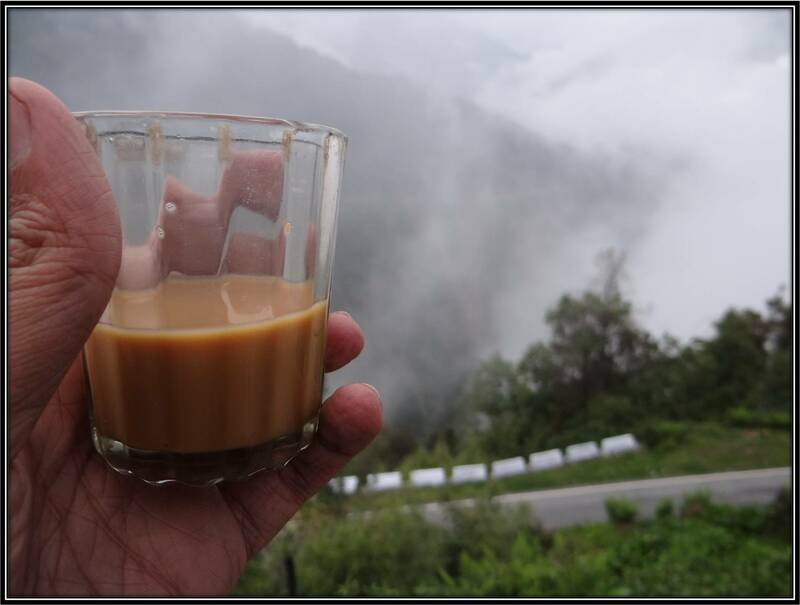 Tip: Take Rohini road to exit Darjeeling. It is newly built and safe to drive on even at night. I take highway 31C from Siligudi rather than 31D which is usually taken by travelers. It did not make much difference in distance but the roads are smoother and have less traffic. There are few villages on the way and the scenic beauty of sprawling tea estates is jaw dropping. I am lucky to have seen this part of Bengal, for it is breathtaking and its people are simple. I have heard that it rains in these areas at the drop of a hat and so is the truth. My journey is delayed by almost 2 hours because of the torrential rain on the way. It is almost 3 pm and I have reached Phuentsholing, the town on the Bhutanese side of the Indo-Bhutan border. Entry to the border town is open but I have to get permits for my journey to Thimphu and Paro. It isn’t going to happen today as the immigration office is open only till 2 pm and the whole of Bhutan is closed tomorrow because of elections. Tip: The whole country is closed and traffic movement is limited during national festivals and elections. Do research on this in order to avoid delays in Bhutan. 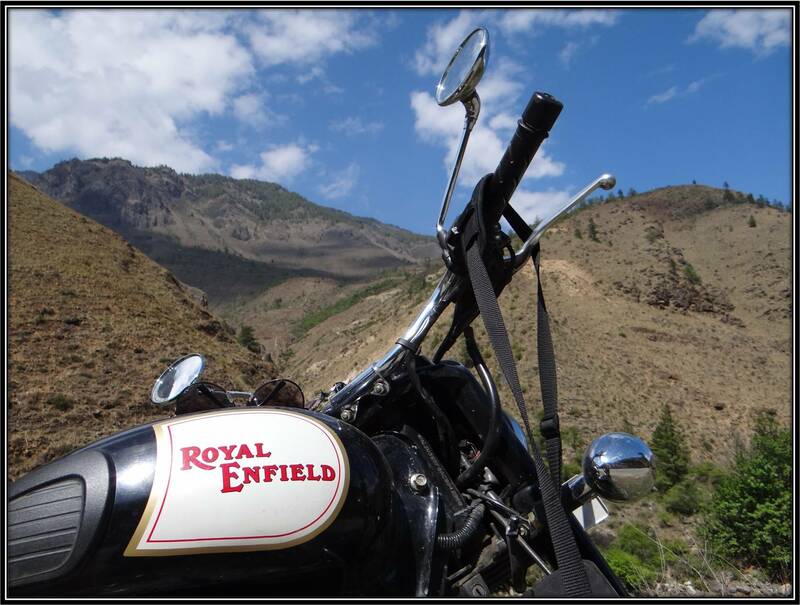 Getting permits in Bhutan for self and for the motorbike is easy. The government officials are very supportive for Indian nationals. It is day 3 when I finally head towards Paro, the destination I have been dreaming of for the last couple of months. 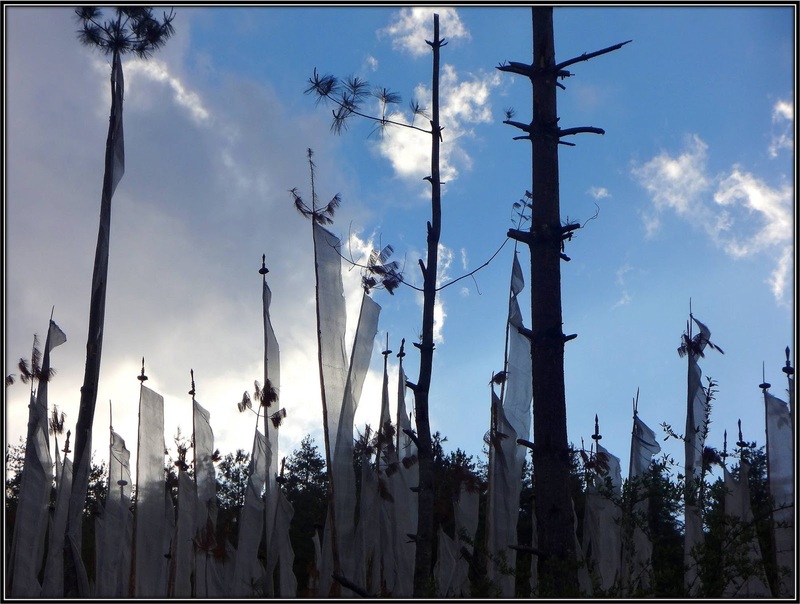 I see numerous Buddhist prayer flags hoisted up on hills. Bhutan’s state religion is Vajrayana Buddhism followed by Hinduism. It has started to pour again and I have to take a pit stop at Gedu, a small village approximately 45 km from Phuentsholing. I see villagers selling local herbs which are mostly used as recreational drugs by locals. 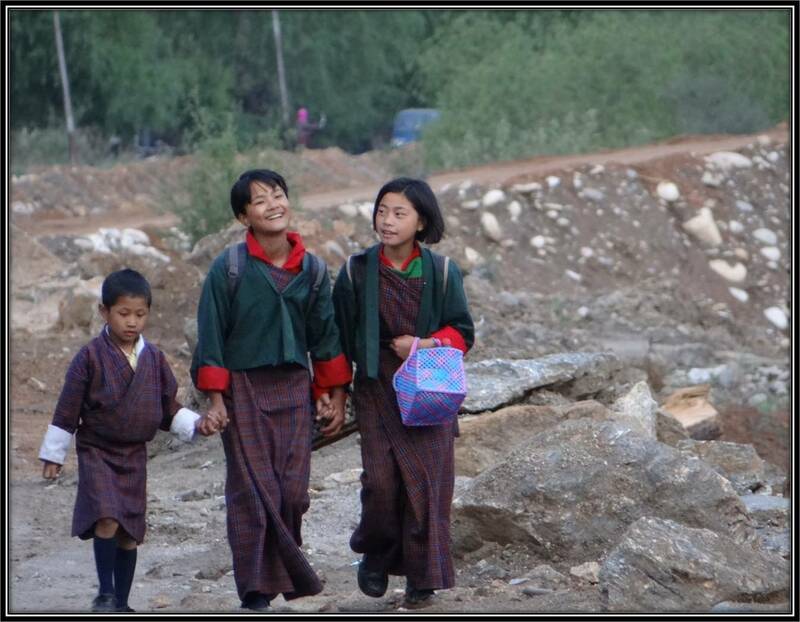 Bhutan is a country which introduced the concept of ‘Gross National Happiness‘ to this world. While I am waiting for the rain to subside, I notice that Bhutanese are the happiest of us all. It is evident in their speaking, their body language and in their lifestyle. The roads in Bhutan are made by The Indian Army and are much better than the ones on Indian side of the border. Driving is a pleasure as the traffic stays on its side of the road, there are proper markings everywhere and speed limit is adhered to by drivers. I am occasionally engulfed in clouds which descend mercilessly on the highway limiting the visibility to only a few meters. It however gives a distinct adrenaline rush to be driving among the mystic countryside without knowing what lies ahead. Tip: There are numerous Indian Army canteens on the highway by the name of ‘Dantak Canteens’ which serve really good food and tea or coffee. The Phuentsholing-Thimphu highway bifurcates at the confluence of Chuzom. Bhutan is such a small country with only one national highway running across it that getting lost was the last thing I could dream of. At the confluence, the emerald green waters of the river that has been flowing alongside me divides into Thimphu River (Wong Chu) and Paro River (Pa Chu). Tip: Fuel is cheaper in Bhutan as compared to India. Fill up the tank in Phentsholing while going in and out of Bhutan. Upon crossing the confluence, the landscape seems to have magically transformed as if the Bhutan that I have already seen wasn’t beautiful enough. There are huge mountains sitting gracefully on either side of the road I am driving on. There are valleys down below with Dzongs dotted all across the landscape. I wish I had one more day just to drive so that I could stop wherever I wanted to. Tip: Indian Oil fuel stations are available only in Phuentsholing, Gedu, Chapcha and then Paro. If you run out of fuel in the middle of nowhere, find the nearest village. Locals store fuel and can give you at a higher price. As I drive from Chuzom to Paro, I am surrounded by majestic mountains and pristine skies. I stop my motorbike just to listen to the sound of silence around. The roads are deserted and all I can hear is the sound of The Paro river below. It is so tempting to just climb down the ramp and take a dip in the icy cold water, if only I was not getting late.